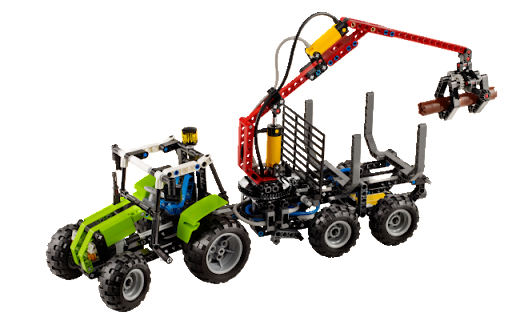 Despite there is not a significant difference to the images previously released, I leave you with the official LEGO images for the new 8049, Tractor with Log Loader, which TBs got the permission to publish. The only difference ts that the watermarks are absent, thus making it a bit easier to look for the model details. I know, I know... there is already more online. They should follow shortly here too, in a longer post. Excellent! 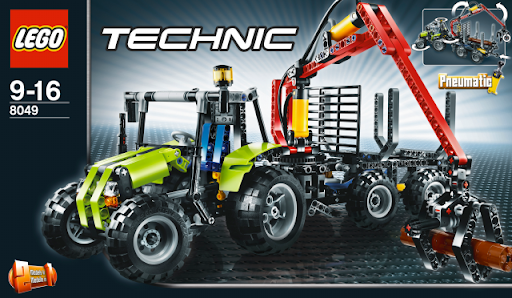 I've already posted a higher resolution version of this at Eurobricks. We can confirm that we'll get getting two yellow actuators, a pump, two switches, and there must be a T-fitting. We can also see that the turntable is driven by an 8 tooth pinion gear. There is "landing gear" on the trailer. I haven't seen any pictures of the alternate model. If you look at the description on Amazon, you will also see that it says a motorized PF compressor can be added!!!!!!!!!!! !